Pack your lawn chairs and a blanket and come out to the NSLM for the first Open Late concert of the season. Northern Virginia bluegrass band Ashby Run will perform from 6:00 to 8:00 p.m. and local craft beers and Virginia wines will be available for purchase. Our first Open Late event partner is Middleburg Hunt Point-to-Point. Open Late concerts occur one Friday night per month throughout the summer. Be sure to save these upcoming Open Late dates - May 27, June 17, July 29 and August 26. Bill Johnson -- Bill has been performing and enjoying bluegrass music for nearly 30 years. He has played with several local bands and has extensive experience in entertaining the public. Bill sings lead and harmony on many of the bluegrass favorites and plays mandolin on instrumentals including "fiddle tunes" and numerous banjo selections. Some of the "crossover" tunes that Bill performs are: "Riding My Thumb To Mexico", "I've Got Stripes" and "Friday Night Blues" to mention a few. He has performed at many of the local wineries, community festivals, Bluemont Concert Series, Marriott Ranch and Arlie Conference Center events. Bill also donates a lot of his time entertaining residents of local nursing homes, assisted living centers, Ruritan Clubs and participating in annual Fire Department fund raisers. Carol Manuel -- Carol started playing bass in 1998 and has not put it down since. The Bluegrass community showed her the heart and soul of the Bluegrass/Gospel bass. Carol has played Upright Bass for a variety of bands including the Gospel Keys, Narrow Passage and Doug Jimmerson (Tenor, Civil War Music). Carol derives great joy from playing the bass. Wade Manuel -- Wade comes from a background of Country and Bluegrass music as his father (Bill) has been performed Country and Bluegrass music for over 50 years. Wade first picked up a guitar in Vietnam (1972) and detoured for a while playing "Rock n Roll" rhythm guitar. In 1997, Wade bought his first mandolin and returned to his "roots" and has been playing Bluegrass and Bluegrass Gospel ever since. 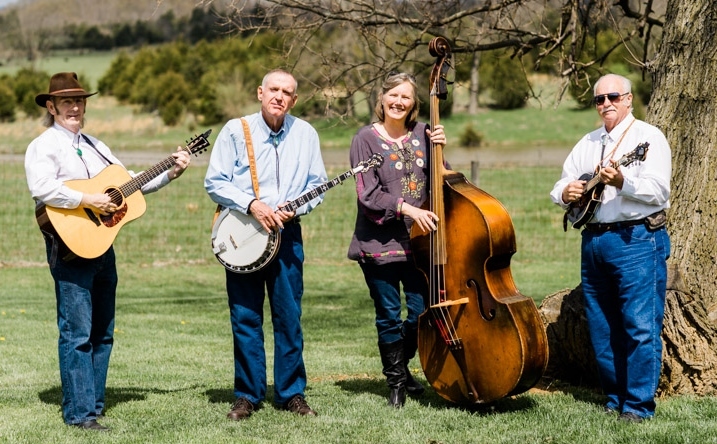 Wade is a former member of the Bluegrass Gospel band "Narrow Passage" and is one of the founding members of The Gospel Keys, which formed in 1999 to perform Good Old-Time Traditional Bluegrass Gospel Music. Bluegrass Rules! Post Time 1:00 P. M.
Come join us! The Middleburg Hunt hopes that you will join us for a day in the country to enjoy the exciting sport of steeplechase racing at one of the most beautiful race courses in the nation. Glenwood Park is known for offering spectators a spectacular view of the racing action. This year's race card once again includes racing over the timber course, the hurdle course and on the flat.